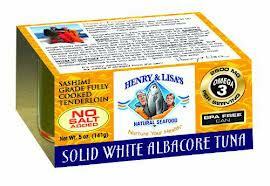 Henry and Lisa’s specializes in natural seafood. See 7+ Henry & Lisa’s Reviews and save an extra 10% on Henry & Lisa’s with Coupon Code* YAG250 at iherb.com/Henry-and-Lisas?rcode=YAG250. Nutrition: Serving 85 g, Calories 150, Fat 2.5 g, Carbs 0 g, Fiber 0 g, Sugar 0 g, Protein 21 g.
Ingredients: Solid white albacore tuna fillet, salt and nothing else. No preservatives. No added chemicals. No antibiotics. No hormones. Dolphin safe.